Ask LH: Should I Use A Paper Resume Or An Online One? Dear AA, The paper resume still has some life left, but you want to have an online presence as well. We're in a transition period where many companies still like to have your qualifications outlined on a printed sheet, while others don't. You should have both ready to go, but that doesn't mean you have to update more than one document. Embracing the online resume doesn't mean you have to let go of paper if you have the right approach. An online resume can be tracked really beautifully (depending on how you post it and where) and nothing is more powerful to a job seeker than analytics. It also means you always have it with you, in the form of a URL. Lastly, you have more visual flexibility with an online resume. That said, you shouldn't choose an online one over a traditional one–the two are complimentary and, at least for the time being, you need both. You also have to be aware that online resumes tend not to parse well into Applicant Tracking Systems (ATS). For example, if you submit an HTML resume the parser may not know how to render and read it correctly, or may automatically convert it into flat text which doesn't show up very nicely. To summarise, online resumes offer greater design flexibility and convenience, but the world hasn't caught up entirely. 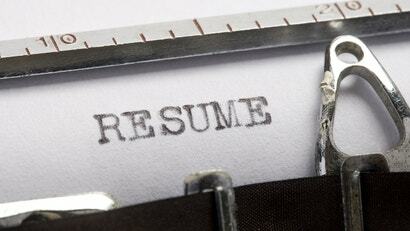 While some jobs may prefer or require an online resume, you'll need a typed or paper copy as well for others. Let's take a look at how you can maintain both types of resume without too much extra effort. Whether you're submitting an online or not, employers may perform a quick web search or two to find out more about you. The web can overshare if you don't keep your online privacy in check (particularly on Facebook) and may have negative results for someone with your same name. Fixing these problems require a variety of tactics, but you can improve your search results quickly by creating profiles on professional landing page sites. While it may seem redundant, these sites offer better search rankings, because many people use them. Search engines also favour this kind of information when looking up a person because it comes from a specific profile (rather than, say, a mention in a Facebook post or an article). These pages require very little time to create, and if you put your work history on professional networking site LinkedIn you can automatically pull that data (and have it update) automatically. For that reason, first go create a LinkedIn account if you don't have one, and keep it up to date. This way you can maintain as many pages as you need without updating too often. 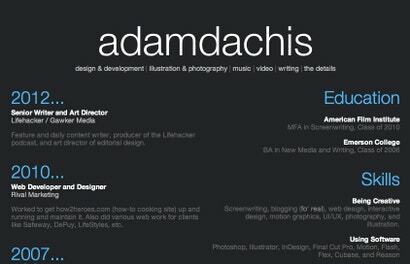 Establishing an online presence stemming from LinkedIn comes with another benefit: an easily-printable resume. LinkedIn Labs offers a handy resume builder that you can use to create a printable resume automatically filled with the data in your profile. This saves a lot of time when it comes to formatting, typing and creating a variety of sections. On the other hand, building everything around LinkedIn means your primary presence exists on other people's websites. You may want to create your own. In addition to benefiting your search results, a personal website offers more control over the content you show to the world and full creative flexibility. That leads to some pretty stunning results. If you need a starting point, we have a simple, editable script you can use to create an online resume with a one-click print option. While it will require a little more work than most of the landing page sites you'll find, it gives you full control over what you display to your prospective employer. Relevant, specific experience gives you an edge when applying for work, and that information may change depending on the company. Hosting your own page means you can create several and tailor each one to each employer. You may prefer an online resume or a paper one, but when you want a job you need to send what the employer prefers. This might seem like common sense, but many people provide something different than what's requested in hopes of standing out. While they may succeed in doing so, they won't receive any positive recognition for it in most cases. You want to prepare both so you can provide whatever the employer requests. When an employer isn't specific, you can offer both options to allow them to choose what they prefer. While we're moving towards an increasingly online world, we're not quite there yet. Prepare yourself for both possibilities, and you'll never send the wrong type of resume. I know that the first image is from about.me but what tool did you use to create the second image? I'd quite like to use it for my own cv, I like the way it groups your activities into easily-scannable year groupings.